Local products under the Made in Azerbaijan brand continue to conquer foreign markets. The Azerbaijani company Azhazelnut signed a contract with Latvia’s Alisco for the export of hazelnuts to Latvia worth $250,000. According to the Economy Ministry, as part of the export mission of Azerbaijan to Riga on April 7-12, a preliminary agreement was also reached on the export of pomegranate products between Azerbaijan’s Mars Fk and the Latvian firm Auglu Serviss. In addition, a number of Azerbaijani companies involved in export mission held negotiations with Indian and Latvian companies and supermarket networks to export and sell their products. Furthermore, Azerbaijan's Tourism.az Company has agreed to organize a visit of the tourist group to Azerbaijan in October to increase the export of tourism services with its Latvian partners. The export mission included 23 companies operating in wine and other alcoholic drinks, food and textile products, as well as in tourism. Azerbaijan is known as one of the few countries in the world enjoying favorable climate conditions suitable for hazelnut growing. Several varieties of hazelnuts, such as Atababa, Ashrafli, Ghalib, Ganja, Sachagly, Topgara and Yagly, are cultivated in Azerbaijan. Many of the country's hazelnut orchards are situated in the foothills of the Caucasus Mountains in the regions of Gakh, Zagatala and Balakan. Today, Azerbaijan has become the world’s third largest hazelnut producer and exporter. As many as 20,850 tons of hazelnut were exported in 2017 worth approximately $115 million. The main markets for the Azerbaijani hazelnut are Italy, Russia and Germany. In the first half of 2018, exports increased by 34 percent to 6,700 tonnes. Industry experts expect annual exports worth $150-200 million in the near future. Areas under hazelnut cultivation are expected to increase to at least 80,000 hectares by 2022. The output is expected to be higher than in 2016 and 2017 given the high growth rates. In 2017, country produced 45,500 tonnes of hazelnuts. Azerbaijani hazelnuts are being introduced to the international markets to enlarge the export routes. Earlier, Azhazelnut signed a contract for the export of 21 tons of hazelnuts to Russia. This year, Zagatala nuts processing plant plans to export products to the Swiss market. During the Azerbaijani export mission’s last visit to Switzerland preliminary agreements on hazelnut export were reached with Switzerland's GN-company, Varistor and Delica and other influential companies. 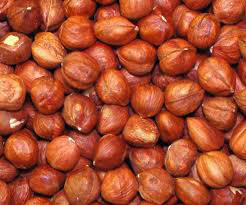 In the course of the mission, Switzerland agreed to import 220 tons of hazelnuts worth $ 125,000. The total volume of hazelnut export from Azerbaijan to Switzerland was 22 tons in 2017. At exhibitions in Dubai (Gulfood 2017) and Germany (Prowein), where Azerbaijani companies took part in a single stand, orders for exporting hazelnuts to Spain were received. In 2016, Ferrero, the world’s largest buyer of hazelnuts, has started purchasing large quantities of Azerbaijan’s hazelnuts. Last year Azerbaijan produced 45,500 tons of hazelnut, which was 32.9 percent more than in 2016. The country exported hazelnuts worth over $100 million in 2017. Development of the non-oil sector mainly depends on the export of non-oil products and the main goal is to expand access to new markets, besides traditional markets.